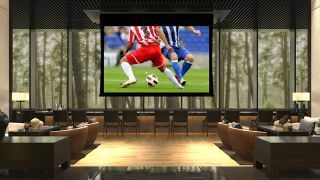 Stewart Filmscreen’s new Phantom HALR High Ambient Light Rejecting screen material is available now, a month in advance of its projected shipping date. A flexible front-projection material well suited for fixed-frame screen or electric roller screen applications, Phantom HALR allows for bright, clear images, day or night. Phantom HALR combines a number of features: flexibility, versatility, and scalability, in seamless sizes up to 40 feet by 90 feet. Phantom can also be perforated for acoustic transparency, featuring Stewart Filmscreen’s proprietary Cinemaperf or Microperf X2 THX Ultra technology. Phantom HALR is also UHD and HDR-ready, to accommodate advancements in resolution and consumer demand. According to Stewart, Phantom can deliver an image that meets ANSI standard industry contrast ratio specs even in a room with more than 50 foot-candles of light shining directly on the screen. Thanks to its proprietary multi-layer composition, Phantom delivers a uniform image, with deep blacks, bright whites, and vivid colors, even at wide viewing angles. Stewart Filmscreen will exhibit at ISE, stand 1-F41 in the Amsterdam RAI, February 7-10.